Friends of Volcano Fair will be held from 10:00 to 20:00 on 20th and 21st, July at Front Garden and on the 5th floor of Site A (Kagoshima Prefectural Citizens Exchange Center). Under the theme of "Let's learn about Sakurajima and volcanic disaster prevention in a fun way", these events are open to the public with free of charge. The taiko performance "Sakurajima Island Drums of Fire (Sakurajima Hinoshima Taiko)" and a "Bingo game" will be held at Front Garden. Winners of the Bingo game will receive emergency supplies for disaster. On the 5th floor, "Kitchen Volcanology", "Making letter pads with volcanic ash" and other activities will be held. These activities are planned to enhance our children's interests in volcanoes. 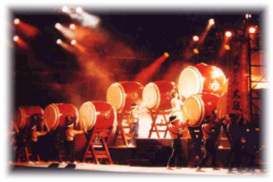 "Sakurajima Island Drums of Fire"
*The taiko performance "Sakurajima Island Drums of Fire (Sakurajima Hinoshima Taiko)"
*Product Fair "The blessings from volcanoes"
*Presentation "The blessings from volcanoes"
Kagoshima is the second largest tea producer in Japan. Please enjoy the special green tea cultivated at the foot of Mt. Kirishima. Various products related to volcanoes are on sale. Please come and have a look at products unique to Kagoshima. 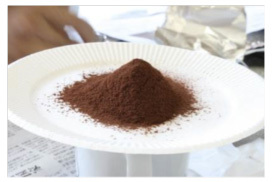 Products made from shirasu (volcanic ejecta) will be presented. The products range from cosmetics to slabs for greening base and residential roof tiles. Please have a look at these world-class products which Kagoshima is proud of. 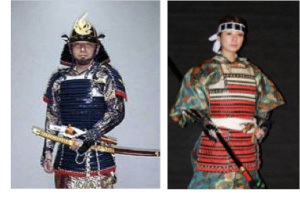 Traditional armor was worn by Japanese samurais. A company in Kagoshima has more than 90% of the share of production of armors in Japan. Some of these armors are worn by movie and TV stars, and others are used as exhibit items at museums. "Dressing up in Japanese armor" is a very rare opportunity even for Japanese. Why don't you take advantage of this unique chance in Kagoshima? The yukata is commonly worn at occasions of summer events such as fireworks display or summer festivals. This is a type of Japanese kimono, a unique traditional culture of Japan. The yukata is confortable during hot and humid summer in Japan. You can experience the mood characteristic of Japan. We have prepared a yukata both for men and women. Please come and try one on. Calligraphy is a traditional culture that is deeply rooted in Japanese lifestyle. Please try to write "火山" (meaning a volcano) or "桜島" (meaning Sakurajima) with a writing brush. We will laminate it for you. We are sure that this will make a memorable souvenir.